Thu., Aug. 16, 2018, 9:47 a.m.
At 5 years old, Casen Hawkins has endured more medical hardships than most people will experience in their lifetime. While Casen can now run around and play, that has not always been the case. And it won’t always be the case. “He’s such a trooper for somebody who has been through so much medically,” Casen’s mother, Katie Hawkins, said Tuesday afternoon as volunteers from Make-A-Wish Idaho and Lewiston Home Depot worked to install a playground in her front yard. Casen has Batten disease, or neuronal ceroid lipofuscinoses. It is a rare and fatal inherited nervous system disorder caused by a defect in Casen’s KCTD7 gene. According to the National Institute of Neurological Disorders and Stroke, symptoms can include vision loss, seizures, delay and eventual loss of skills previously acquired, dementia and abnormal movements. While Casen is mostly physically capable, he still struggles with speech, occasional seizures and hearing. Despite the tough times, Katie said Casen is still funny and sarcastic, and he makes her and her husband, John, laugh constantly. “Casen has got this infectious personality that I don’t think you could talk to one person who has come across Casen that hasn’t been impacted by him,” Katie said. And to say he is friendly is an understatement. Katie said her son suffered several medical issues that appeared to be unrelated to each other after he turned 1, and doctors struggled to find answers. “We just popped in and out of the hospital all the time,” Katie said. About three months after his first birthday, Cason came down with pneumonia and encephalitis – or brain inflammation – and lost his hearing. He then essentially reverted back to being an infant – all the gains he made in speech, walking and other motor skills disappeared. Doctors still had no idea as to what was causing the medical issues. Katie said Casen eventually visited a pediatrician at UCSFMC before his second birthday. Doctors ran a battery of tests and diagnosed him with a seizure disorder. Katie said he received treatment and his health started to improve – for a time. After regaining the ability to walk and speak, however, Casen once again regressed in the fall of 2016. His seizures, which John said have always been somewhat unnoticeable, were also out of control in 2016. Casen was having one to two seizures every 5 to 6 seconds, John said. Medication helped Casen walk and talk again, and by 2017, he was communicating and using a walker. Then devastating news was received in April 2017 after Casen returned to San Francisco for genetic testing. There, doctors informed them Casen had a fatal disease. Katie said her son’s brain will eventually start to decline. He will lose basic physical and mental abilities. Most children diagnosed with the disease do not live to their 13th birthday. Casen will start kindergarten in a few weeks, and he has recently started doing things he had never done before – like jumping. “This is the most able he has ever been,” Katie said. 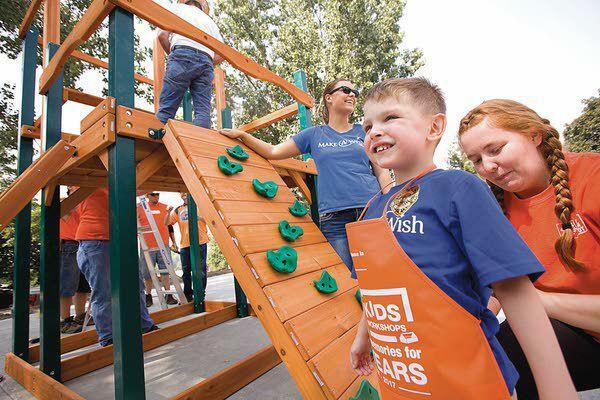 So able, Casen can enjoy a brand new playground at his home courtesy of Make-A-Wish Idaho, which paid for the equipment, and Lewiston Home Depot employees, who volunteered to install the playground this week. Make-A-Wish Idaho volunteer wish granters Ashlie Jensen and Kimberly Carper visited with the Hawkins family in September to discuss the best wish for Casen, Carper said. “In Casen’s case, he really wanted a playground,” Carper said. With Casen’s lack of mobility and diminished memory at the time of the discussion with the wish granters, Katie said she and John thought a vacation, which is often granted by Make-A-Wish Idaho, was not a viable option. The couple brought up the idea of a playground and ran the idea by Casen – and what child would not want his or her own personal playground? “He is just over the moon about this playground,” Carper said. The playground features a soft rubber surface to prevent injury if Casen falls, and when Casen starts losing his physical abilities, the playground equipment will be adjusted to accommodate his needs, Katie said. Katie said the playground is also intended for other children in the community with disabilities to enjoy with Casen and, when the time comes, “when Casen is not with us,” Katie said. Home Depot employees spent Tuesday and Wednesday putting the playground equipment together. “Those guys are putting their hearts and souls into this wish,” Carper said. Manny Astorga, Lewiston Home Depot assistant store manager, was happy to be able to help. Published: Aug. 16, 2018, 9:47 a.m.